Differential weight detector - for the security of objects on display. Typically a group of objects on a table, plinth or mantelpiece will rest on a sheet of Perspex or plywood. That in turn sits on an array of WeightSense sensors (pads). If any of the objects is lifted up the system will alarm, sound and send a radio signal to a security system such as GalleryMaster. Radius of wireless signal: Up to 40m internal. Lifetime for battery approx. 2 years. Temperature: Minus 10 to plus 50 deg. 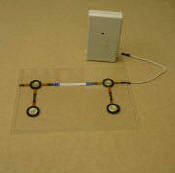 C.
Left - example shows an array with four pressure pads underneath a sheet of Perspex. Anything weighing over 50 grams (2oz) placed on the Perspex and then lifted will sound an alarm. This weight sensing alarm system is designed to detect and warn against any tampering with lids, vases, boxes or other small display objects on their own or on a shelf or table. For example, the alarm is simply positioned inside the box and the sensor raised on some suitable inert material so that the lid's weight is taken mainly by the sensor. Alternatively an array of sensors is placed on a mantelpiece. A sheet of Perspex placed on top and the ornaments positioned on the Perspex. The maximum weight each sensor can stand is 4kg. So for a display weighing 16kg at least 4 sensors will be required. The unit is supplied with an internal battery. Assembly: To switch on, the on/off switch is underneath. Lid protection: Once switched on, place the lid on the sensor. Shelf protection: Lay out the array of sensors as specified. Place the Perspex on top and reposition the ornaments. The alarm will sound (5 seconds) and go silent. If the lid is lifted the alarm will sound for 5 seconds and reset. Check the batteries regularly. Low profile pad is just 4mm high. Left - WeightSense with one pad which could fit inside a Tureen and protect the lid. The pressure sensors are delicate, so please take care when handling the unit. They are designed to detect small load changes and deflections, and may be damaged if dropped or they are subjected to a knock, excessive force or weight. 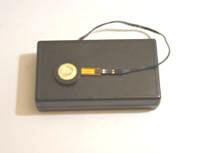 If a system is used with a radio link the WeightSense will use one battery and the radio transmitter another. Check both.